PSX TOCA Touring Car Championship (USA) "max points" in 10:37:18.72 by Mothrayas. 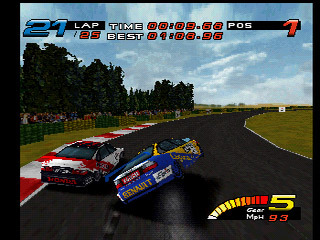 TOCA Touring Car Championship is a racing video game developed and published by Codemasters. It is the first game in the TOCA series. It is based around the 1997 British Touring Car Championship season, and features the nine tracks and eight works teams from that season. Prepare to strap yourself in to watch this nearly 11 hour run from Mothrayas that goes through the game's Championship mode, in what is the longest TAS ever published on TASVideos.